In November, the ASPCA partnered with the networking app Bumble, and The Dodo to help the millions of shelter dogs that need loving homes, through their #FindYourFido initiative. My good friend Dorothy Wills-Raftery of the FIVE SIBES blog helped raise awareness of this initiative. As part of her efforts to help spread the word, Dorothy held a giveaway on her site and we won an ASPCA #FindYourFido gift pack! Here's a peek at the fun stuff we won in the prize pack. The ASPCA's #FindYourFido prize pack we won from the Five Sibes crew! Yikes! Phoebe really needs a haircut doesn't she?! 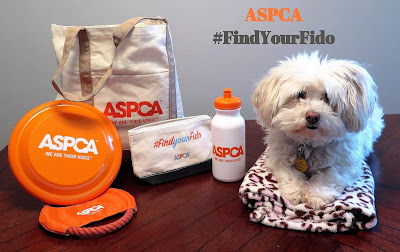 We love the ASPCA Find Your Fido canvas tote bag and small zippered bag, frisbee, rope toy, and water bottle. Something tells me Icy will be the one to really enjoy that rope toy! 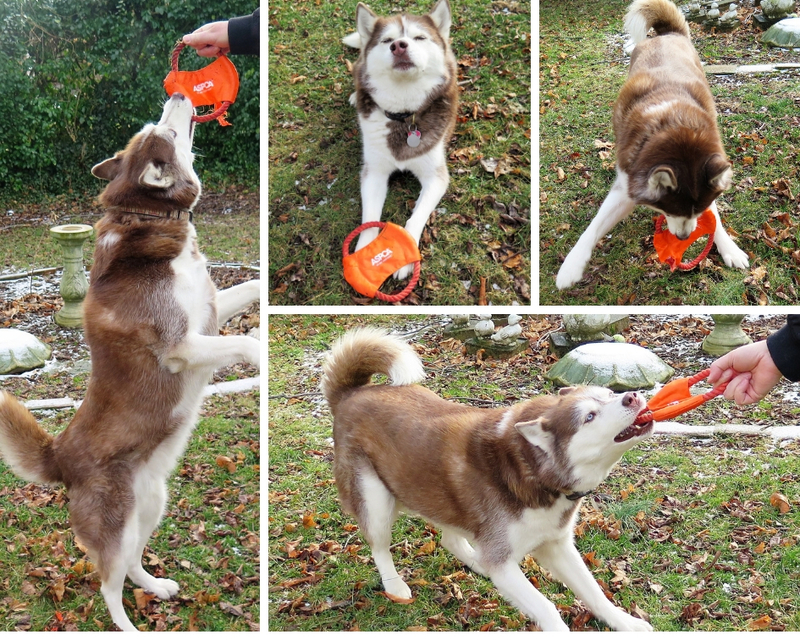 Icy had a blast playing with the ASPCA rope toy we won in the #FindYourFido prize pack! Thank you to the FIVE SIBES for this great giveaway! And thanks to the ASPCA for everything you do to help shelter animals in need and to fight animal cruelty in all it's horrible forms. Where would we be without organizations like the ASPCA? Read what the ASPCA has reported about the impacts of the Government Shutdown in the U.S. on animals. The shutdown is now in it's 27th day with no clear end in sight. It's not pretty. 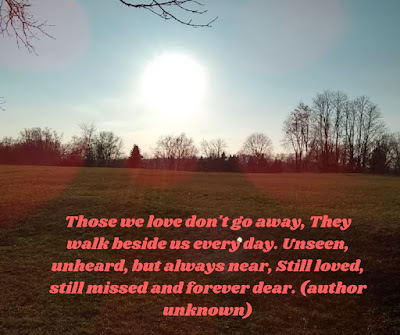 As many of you know, we recently lost my beloved cousin Carolyn and our family has been grieving. In tribute to her life as a compassionate social worker and an animal welfare advocate, I made a memorial tribute donation to the ASPCA in her name. Personally, I think donations to causes that someone you love believes in is a wonderful alternative to flowers or gifts, for any occasion or event. 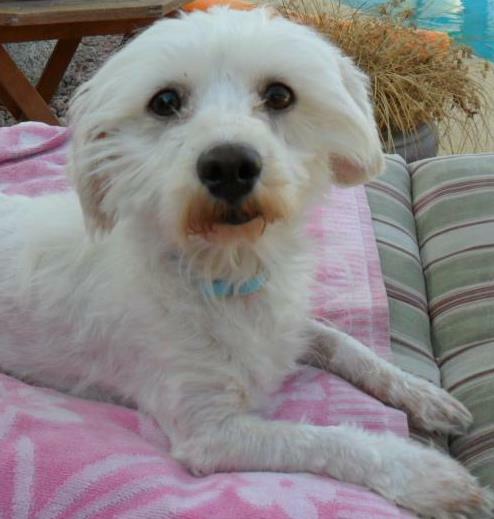 ** There are rescue organizations for nearly every breed of dog out there. ** Kids want a Guinea Pig? Please consider a Guinea Pig rescue like Metropolitan Guinea Pig Rescue. There are also animal rescues for other small animals like rabbits, hamsters, mice, gerbils, and others. Just do an online search for one closest to you! Isn't it terrible? My heart breaks for these families, including the furry members. I pray these families don't end up having to surrender their pets to shelters and I pray the shutdown ENDS already! I'm so sorry about your recent loss. Congrats on winning the Five Sibes giveaway. It's awesome that you mentioned small animals in rescues too. There are even reptile and other exotic pet rescues! I feel like a lot of people don't realize that you can adopt more than just cats and dogs. Oh thank you so much. I'm amazed at how many different kinds of rescues there are out there - you can literally adopt any kind of pet you want. Many people don't realize how many small animal rescues there are - I hope to raise awareness as much as I can. We definitely support pet rescue and adoption! Every critter deserves a loving home and we're so happy Phoebe found one! Love the items - the pull toy is awesome, and the color is fab! So true, every critter does deserve a loving home! Icy is so happy with her rope toy. She is totally hogging it LOL! What a great initiative! You know we love anything that promotes adoption. Icy looks like she's really having fun with the frisbee. Same here! We will always promote anything that helps save animals and find loving homes for pets in need. My wife and I only adopt. Since we only want dogs as companion animals, we can't see a reason to buy since there's so many dogs needing rescued. Yes, there are so many pets in need. They become homeless for so many reasons, but rescue & shelter pets can be terrific pets and family members! Thank you Susan, I appreciate that. I felt it was a great tribute to her, much better than flowers. I just know she would agree. She was a huge dog lover and involved in helping to train rescue dogs. Adotion is always the way to go. There are pedigree rescues if you need them so NO excuse not to adopt a rescue! ConCATulations on winning the prize pack and Yep I reckon Icy has laid claim to the rope toy alright. It's so easy to adopt, not matter what breed of dog or cat you're looking for. I have no issue with reputable, quality breeders but I do encourage people to try to find the pet of their dreams through rescue first if they can. So many pet are abandoned and rescued from puppy mills and they turn out to be awesome pets! Thanks Marjorie. What a great prize pack you won. Icy looks like she’s having a great time. I hope they are able to work something out on this shutdown soon for the animals sake as well as the people who are working without pay. The dogs, mainly Icy, are enjoying the toys. I like the bag & water bottle. I pray this shutdown ends soon, it's cruel to make people & families suffer like this. What a nice package from ASPCA. It is so sad to see how many dogs and cats need forever homes. It really is a fun prize package, we are all enjoying it. The need for homes never ends for pets, I just don't know how to make it stop. Icy looks very happy with her new toy. It is crazy that the government is shut down in the first place, I hope they open it soon. I know there are some groups who are helping federal workers with pets by providing food for the animals. I was so sorry to hear about your cousin and I think making a donation in her name is a wonderful way to honor her. She is thrilled with it, as you can see from her photos! Thanks for the kind words about my donations in memory of my dear cousin, it meant a lot that I could do that. I know she must be smiling about that from somewhere. The shut down is so sad, I get really upset about it. Those poor families, how could our government do that to them!? I am so sorry about your cousin...I hope that one day you will find peace and joy in the memories you shared together. I know losing a loved one is so heartbreaking any time of the year, but especially tough near the holidays. I was so happy you won the ASPCA Gift Pack! What a great post and pics! I loved how Icy was playing with the frisbee, and Phoebe looks just like a little princess sitting with the winnings! Thanks so much Dorothy, it's a great prize and a wonderful way to raise adoption awareness. Knowing my cousin is no longer here breaks my heart, it's still unbelievable. As the neighbour to the North I must admit, we are all shaking our heads at the government shut down. It's terrible. Sorry for your loss. It's always difficult. As for adoption, believe it or not, even with our award winning blog, and obviously very pet friendly selves (we are vegan as well) just because we live in an apartment (9th floor) we are always turned down as adopters. It's infuriating. So .... on our end we feel a lot of frustration. Oh no! they turn you down simply because you live in apartments!? That's crazy, we have so much dog friendly apartment living in the US. It's still not nearly enough but there is a lot. That's so frustrating. So is our crazy gov shutdown, but the big issue is that people are suffering through no fault of their own because our stubborn government can't play nice w/ each other in the sandbox. Both parties are at fault, I'm disgusted with all of them. We can't do anything until our house is finished. Once that happens, we want to foster. I love fostering! I'd foster so much more if my husband would let me. Phoebe and Icy look adorable has usual. It is a cool prize, and Icy is enjoying her rope toy for sure. The shutdown is really awful, I wish I could help those folks - they've given so much as public employees, it's so unfair. Both parties are using those people as pawns, it's horrible. We will adopt our next dog. We actually adopted Bentley and Pierre but from a friend who couldn't keep Bentley and Pierre is our daughter's. There are many places helping those with pets not being paid during this ridiculous shutdown. Oh that is music to my ears! I can't wait to adopt another dog myself. I've been searching for places helping the pets of government workers who are not being paid. Animals always suffer along with their owners. There's really nothing like adopting an animal with a story. The statistics about the shutdown are so disappointing, it's so awful to see our country like this.